I've just finished reading the book Peaceful Parent, Happy Kids: How To Stop Yelling and Start Connecting by Dr. Laura Markham of Aha Parenting. I liked it so much (and am so confident that you will too) that I'm giving away a copy of the book to one lovely reader! I think of myself as a gentle and conscientious parent and I try my hardest to live up to those ideals. Yet the demands of everyday life with two little boys can easily add up to a recipe for less than peaceful parenting in actual practice. Maintaining composure in the face of defiance, selective hearing and sibling arguments is a tall order. Which is why a toolkit of actual responses is so useful! 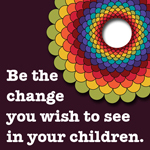 Most parenting books focus on changing on a child's behavior. Without addressing the needs and emotions driving the behavior however, this tactic isn't usually very effective and often worsens the problem. This book explains why children respond as they do and reminds us of what is developmentally appropriate behavior to expect from our children. Most importantly, it challenges us as parents to evaluate what we can change to improve our relationship with our children and subsequently, their behavior. Part One, Regulating Yourself, explores the notion that managing our own emotions and actions is what allows us to feel peaceful as parents. Ultimately, we cannot control our children but we can control our responses to those times when our buttons are being pushed. This section offers tools to help us as parents regulate ourselves and our emotions, which will in turn teach our children to do the same. Part Two, Fostering Connection, is full of information on how to build and maintain a deep relationship with your child based on love, trust, respect, security, and independence. These chapters address everything from the daily challenges of getting out the door with your child to getting him or her to bed. It also tackles things like how to listen as a parent and what to do when your child shuts you out or won't listen to you. Part Three, Coaching Not Controlling, leads readers through the process of coaching children to handle their emotions, manage their behavior and develop mastery rather than controlling for immediate compliance. It explores emotional intelligence, empathy, anger and handling meltdowns. Fostering emotional connection with your child creates real and lasting change. When you have that vital connection, you don’t need to threaten, nag, plead, bribe — or even punish. If you’re tired of power struggles, yelling and searching for the right “consequence” look no further. You’re about to discover the practical tools you need to transform your parenting in a positive, proven way. Perhaps the very best thing about this book is that it offers action guides and realistic scripts for navigating through challenging situations that seem to come up on a daily basis. Sound like something that could make your days just a bit easier and more enjoyable? 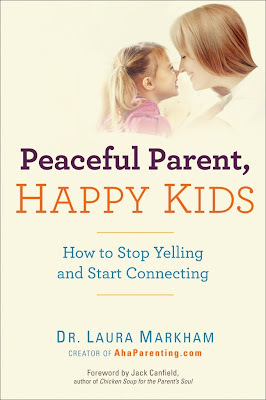 Enter my giveaway for your chance to win a free copy of Peaceful Parent, Happy Kids by using the entry form below. The winner will receive one paperback copy via mail and I'll ship to any country. My way of sharing the love and saying thanks for reading! The giveaway has ended and Rachel is the lucky recipient - congratulations Rachel! If you missed out, have a look at the Aha! Parenting website, blog, or Facebook page for lots of parenting inspiration. I wish you all the best on this crazy and amazing journey!